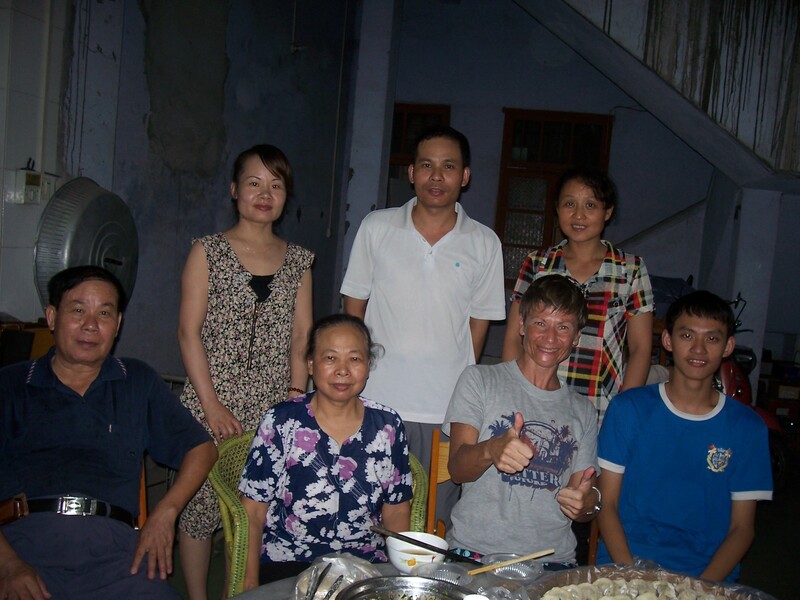 My last day in Longzhou will soon come to an end. Joe and several of my students are coming over around 7 p.m. to say good-bye. Tomorrow morning at 9 a.m., the movers are coming with the truck to load things up. 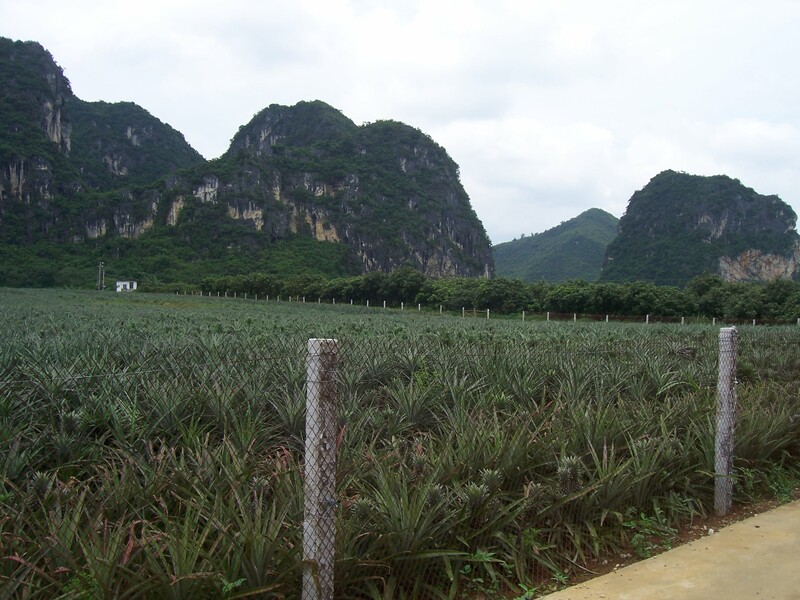 I’ll be on the bus toNanningby noon for my last weekend in Guangxi’s capital city before making my way to the airport and back to Sichuan. Has this day been a good one? Well, it certainly has been fun so far, although some disappointments along the way. Early morning, I was up and about, putting the last touches on my boxing efforts before the moving company boss arrived to survey what I had. Wednesday I spent the entire day packing up, from 9 a.m. to 10:30 p.m. with a few outings in the city to mail 2 boxes to Amity’s Nanjing office, close my bank account and drop off digital pictures at the photo store. No pool because the staff said they’d close to clean but Thursday, they promised they’d be back in business. Mr. Wang with the Hui Tong Moving Company popped in to take a look at what I had to determine how big a vehicle they’d need. I had just finished putting the last number on all items, from boxes to furniture, when he walked in the door. I honestly had not a clue how many things I’d wind up with until I taped the last number to the bed: 99 in total. 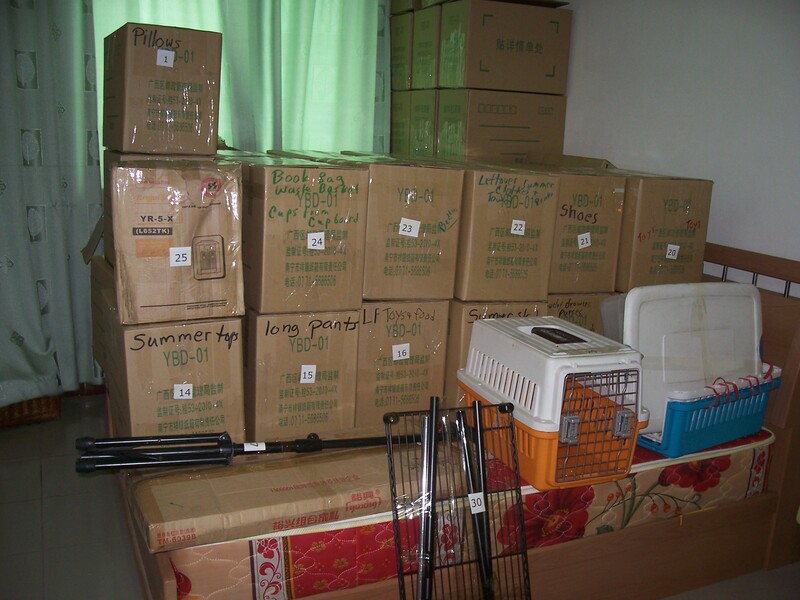 73 boxes and the rest chairs, couch, oven, printer and numerous other things. Just 33 in this room. A few more in the living room. 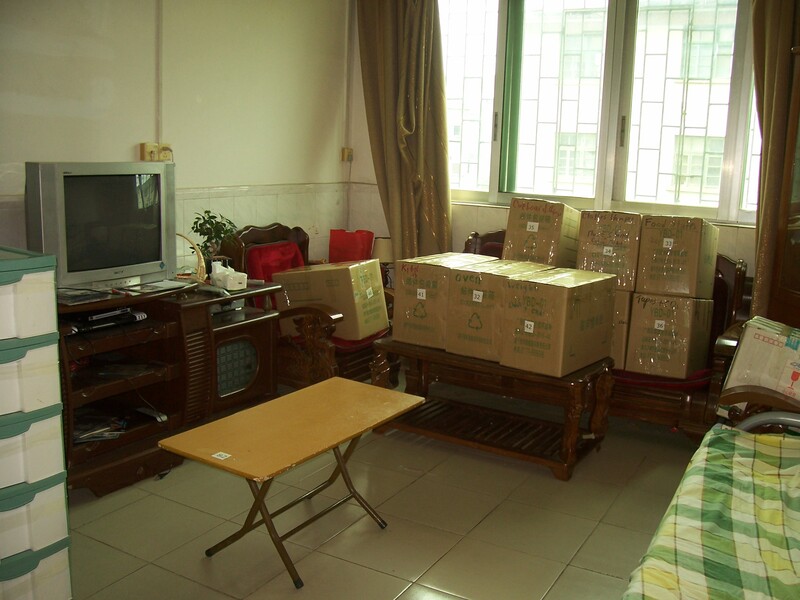 A lot of stuff but what I couldn’t believe was that I came to Longzhou with exactly the same number of things: 99. I neither gained nor lost a single article in 3 years. How in the world did that happen?! 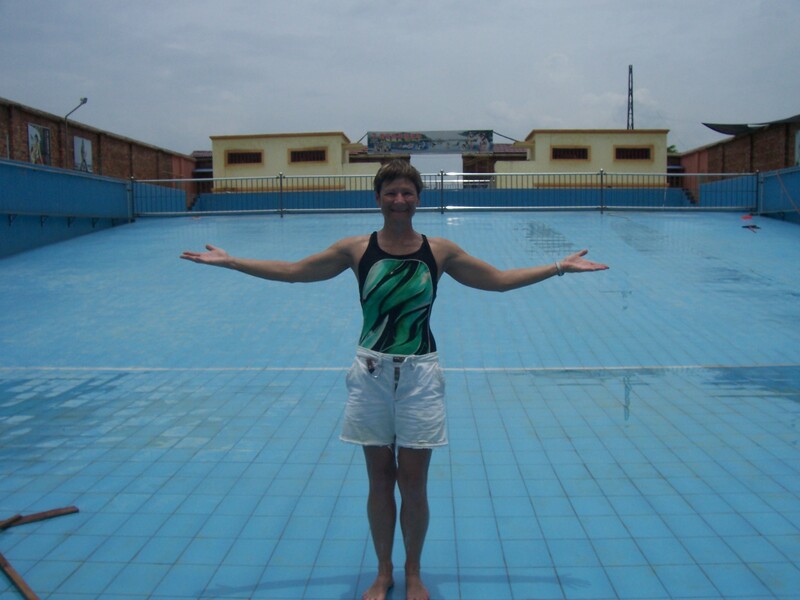 With our sticky, muggy, roasting weather, I was so much looking forward to my last swim at the countryside pool. The sun continued to burst through storm clouds while I walked downtown to catch the bus. It was going to be one of those days where the rain was coming but it would take awhile. In between, we all would suffer in the oppressive, still heat. On the bus, it was a full house at noon when we took off on the usual Number 2 Road route. I did my best to enjoy the ride, even though it was horribly hot. 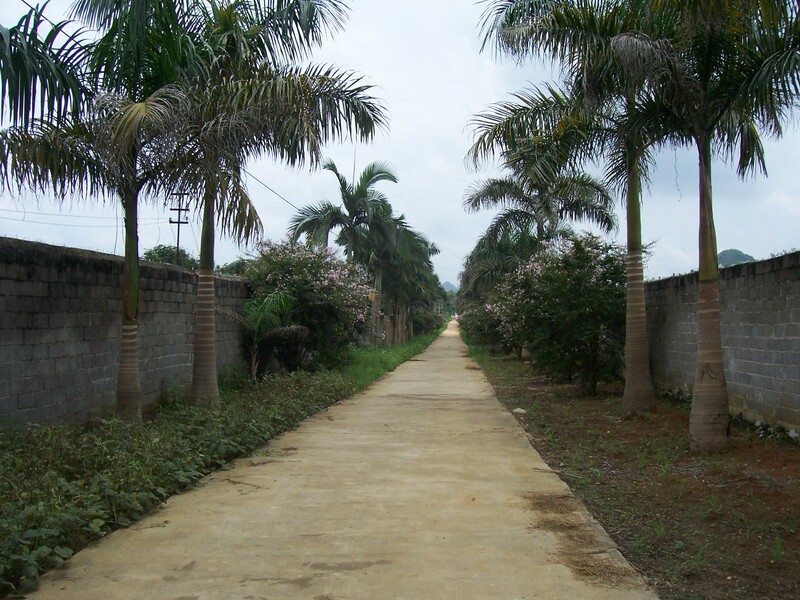 After getting off, I made my way down the tree-lined avenue toward the pool. This swim was really going to be nice! But wouldn’t you know it, when I came to the open front gate, the staff was busy scrubbing the bottom tiles of an empty 50 meter swimming pool. They told me the day before, the water had been cut off so they had to wait until today to clean. They had started at 9 a.m. and were still at it when I finally walked in at 1 p.m. They were at the deep end, finishing off the last scrub by using scouring pads, mops and plastic brushes. 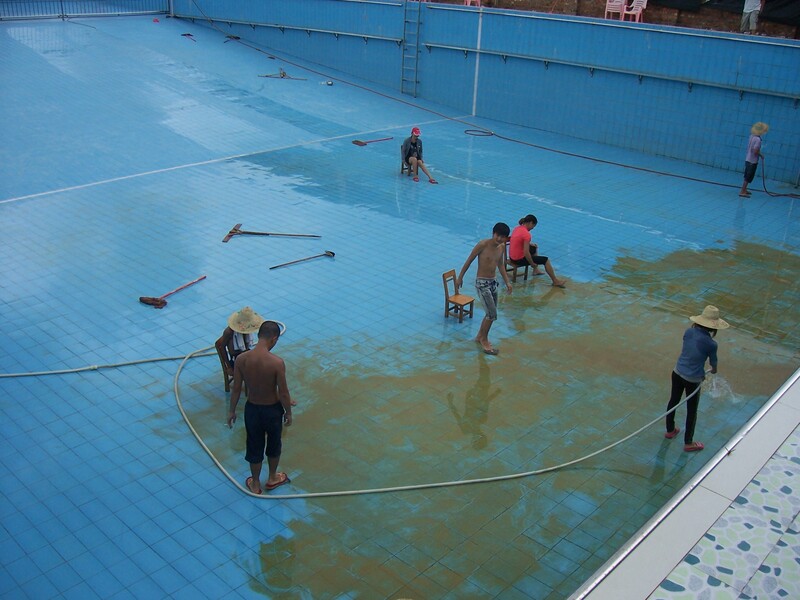 The staff, after 4 hours, is finishing off the last of the pool bottom. Since I had nothing better to do, I climbed down the deep end ladder and joined them. It was the least I could do since they often opened the pool just for me when no one else was in sight. Not the most attractive photo of me, sweating away and roasting, but it makes for a good story. I spent the next 40 minutes , sweating away and dripping, helping them out. 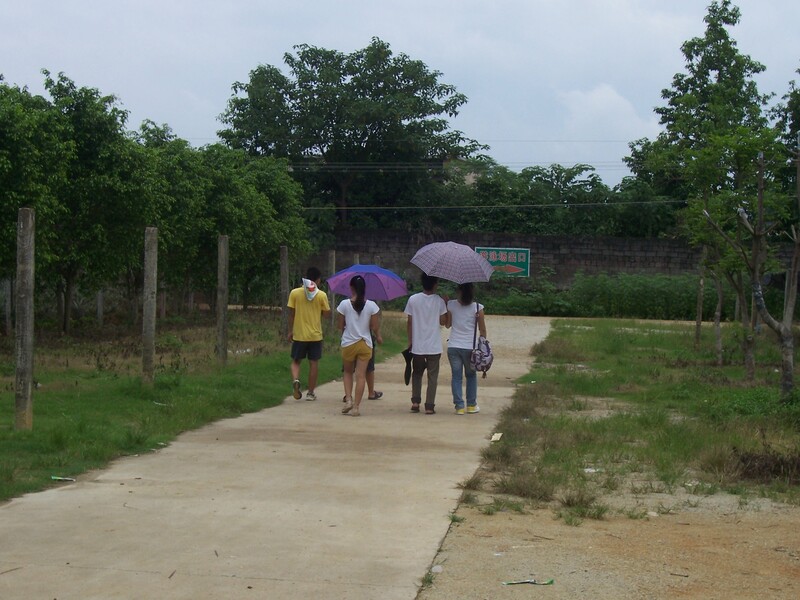 With 10 of us working so diligently, the job was finished by 2 p.m.
We then took a break, sitting under the shaded shelter and eating plump, juicy lichee, now the fruit in season. Puppy played at everyone’s feet and I had a nice chat with the security police officer from the area. He was hanging out in our midst as he had nothing else to do in the village center. The staff, taking a break after all that hard work. Nor was I the only one who arrived thinking they’d have a cool water swim. About 8 other disappointed young folk crowded the deck, stared at the empty pool (as I had done) and moaned that they made a wasted trip. “没有水！” No water! What a wasted trip. They’ll return tomorrow, but not me. 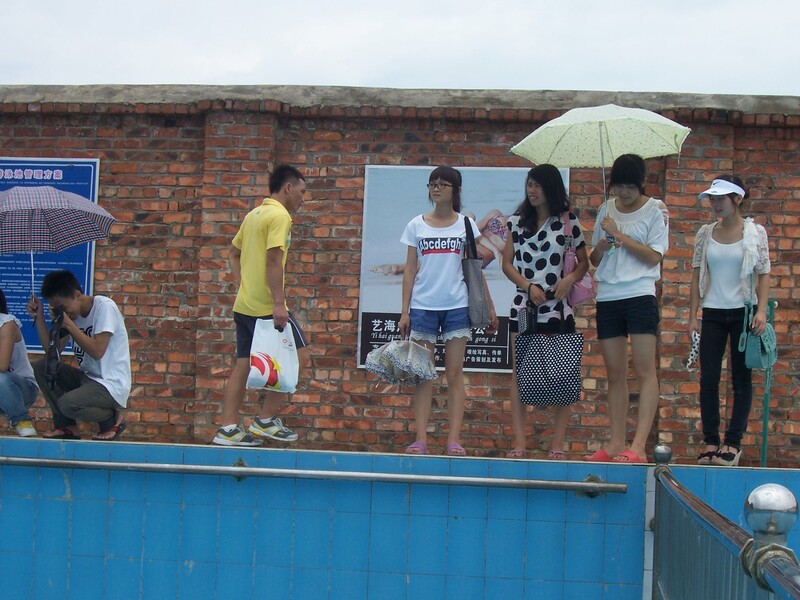 I’ll be on the bus to Nanning by then. 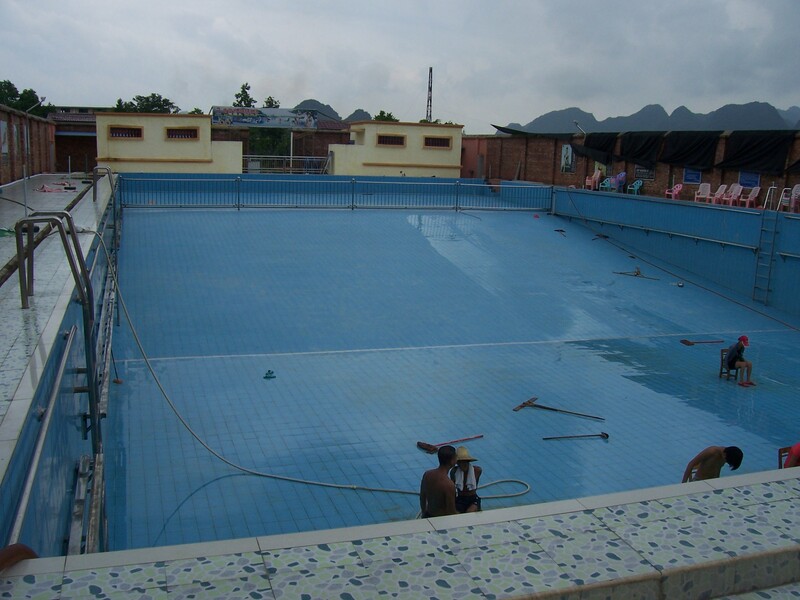 Tomorrow the pool will be open, crystal clean and a beautiful blue, but I’ll be off toNanningby then. I’m certainly not sorry I went, even if I missed out on my last swim. Saying goodbye is important and that’s just what I did to all of the staff. By 3:30 p.m., I was back in the town center and picked up pictures from Joe’s family dinner the other evening. When he arrives tonight, he can deliver them to those present. Joe’s family and I together again during his junior high graduation celebration dinner. 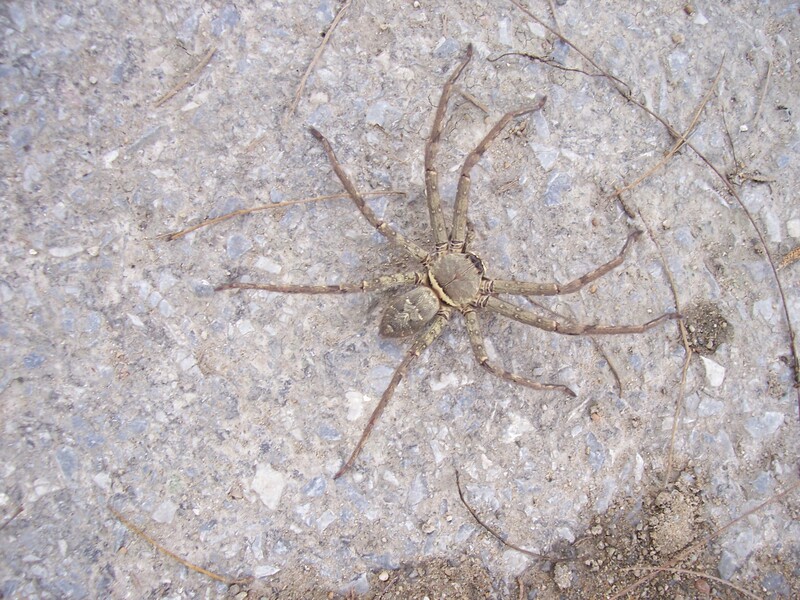 I also walked to the bus station to get my ticket to Nanning tomorrow, spotting along the way an infamous, scurrying insect of the region: The notorious Chinese Wolf Spider, of the tarantula family, which I believe is the culprit of poisoning Little Flower last year. Now it’s a matter of relaxing, finishing off the last of the frozen chicken for dinner and make sure my suitcase is packed for the return to Luzhou. I probably won’t be blogging for a few days on my journey. 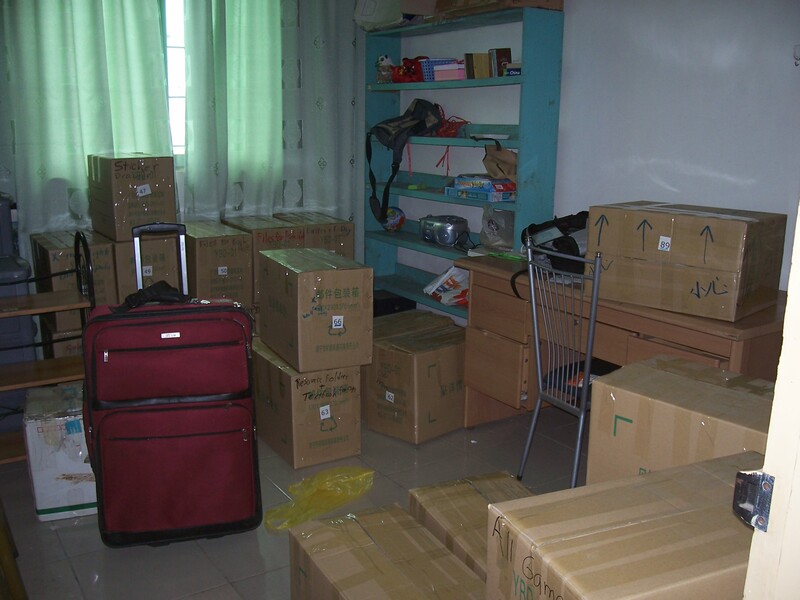 I will need Internet access in Luzhou and that might not be ready yet when I arrive. So for now, I’ll just say Ping An (peace) for awhile until the next entry.